Alo pessoal aí no Brasil, aqui fala Daniel Tabak. Nós iniciamos o retorno hoje de volta para Aruxa! Ontem, nós realmente, como nos falamos, atingimos o pico e foi muito emocionante. 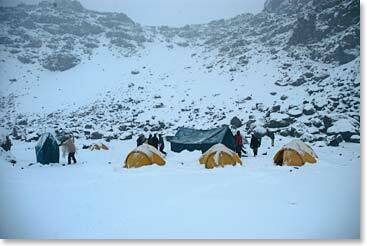 E, agora, nós iniciamos o caminho de volta depois de passar uma noite bem complexa no campo chamado ".Crater Camp" em que a temperatura a noite caiu aproximadamente a -20 °C . Mas hoje, pela manhã, nós iniciamos o trajeto atravessando as geleiras e já estamos aqui bem abaixo, já descemos mais de 2000 mts e o clima muito bom, e o ar agora bem mais fácil de respirar. Estamos todos animados e chegando cada dia mais próximo do nosso retorno. Abração para todos. Twendai! Hello everyone in Brazil, Daniel Tabak reporting from Kiliamanjaro. We started our descent back to Arusha today! Yesterday, as I mentioned, we reached the summit and it was very exciting. And now we started our way back after spending a tough night at the " Crater Camp" where the temperature at night dropped to about -20 °C. 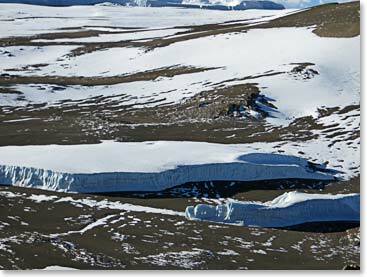 But today, in the morning, we started the journey across the glaciers and we have now descended over 2000 meters and the climate is great. The air is much easier to breathe. We are all excited and getting closer to our return home. Hugs everyone!